I really like 3rd grade. It is fun and I have made new friends. I learned lots of stuff like times and my teacher is cool. His name is Mr. Ahlness. Arbor Heights is a cool school and it has cool teachers too. My teacher is Mr. Ahlness and he is nice. There are lots of new kids this year. That's Arbor Heights. My teacher is named Mr. Ahlness. He is really nice. I made lots of new frends in his class. And he makes math fun. I hope Obama wins. I heard that he will do really cool stuff like lower gas prices. And I think that’s really cool. I think it will be pretty sweet if he could be the very first black president. I don’t like report cards because if I get a bad report card then I get grounded. Report cards are good because my mom and dad know about my grades. I don’t know why they give us report cards. I think it’s because our parents know how good we did in school. I wonder how good I’ll do on my next report card. If I were a turkey and I was getting served for dinner I would run away. If that doesn’t work then I don’t know what I would do. I just hope that I don’t get cooked for dinner. I know maybe I can talk to them and scare them away. No that won’t work because turkeys say gobble. I’m going to try to run away first. I don’t want them to close my school because then I will miss all of my friends. It will stink if they close down my school. If they do close down my school I don’t know what I’ll do. I don’t want them to close down our school. If they do close our school I might havt to go to Gatewood. My mind is on what my brother is doing right now. I wonder if he’s doing math? My mind is on what my sister is doing right now. I wonder if she’s doing art? My mind is on what my mom is doing. I wonder if she’s beading? My mind is on what my sister is doing today. I wonder if she’s walking up the stairs to her class? My mind is also on what my brother is doing right now. I wonder if he's sleeping in his bed right now? My mind is on who the other kids who are coming to our school is going to be. I wonder if they're going to be any old friends of mine. I am not happy about the snow because we might miss school. I don’t want to miss more summer. I hope it's spring soon. After spring it's my favorite season. Summer. My mind is on how long the Big foot assembly is. It might be an hour. My mind is on what my sister’s doing when it’s Valentines Day. I wonder if she’s having a dance. I can’t wait till our Field trip. But I have to. I wonder when our valentines party is going to be. I wonder if it’s going to be after the field trip. I love The Great Wolf Lodge because it has an arcade and a indoor water park and a fudge stand. I like the water park best but that’s just me. I like it best because there’s a whole bunch of rides. My favorite ride is The River Canyon. I also like the fudge. There’s all kinds of fudge there. There’s chocolate , vanilla , and strawberry and other kinds of fudge. Last time I went to The Great Wolf Lodge I spent most of my time in the Water Park. I also spent a lot of my time in the Arcade too and I bought a lot of fudge. That’s all I can think of. If you want to figure out the rest you just have to go there yourself. My mind is on what my mom’s doing right now. I wonder if she’s watching TV. My mind is also on what my dad’s doing right now. I wonder if he’s in a meeting. My weekend was great because I got to sleep over at my friends house. It was so fun. On Sunday I went to church and I got to play lots of games. It was cool. My mind is on what I’m going to do for spring break. I think my mom and sister are going to make me go to the mall. On the 9 days of spring break I’m probably going to have people come over and sleep over. If I do it will be so much fun. When Me and my sister went to the skate park we were scared to go down the ramp. But then I went down and it was very scary but fun. I only went when the skate area was clear. I went down the ramp lots of times. Then we left for a tiny bit to get some food and then came back. Then I went down the ramp some more then ate. Then went down a few more times then I went to the empty basketball court and tried to jump with my skate board. I only could do little jumps though. Then I went home. The wasl was very long but not that hard. It was also very fun to do. The wasl wasn’t like the other tests we take and the lucky thing was it didn’t count for any of your grade. That’s what’s fun about it. I like the wasl because it helps you learn more stuff. And sometimes you even do the stuff that you already learned. Today the wasl got harder because we did part two. But on the other hand it was still really fun. I also got some good snacks. We got some juice and some granola bars. I think it might have been longer. But it was way more fun than part one. Today our snack was some string cheese. It was delicious. Today we also did the math wasl test. I liked the reading one way better. Today was the last day of the wasl. It was so fun and the hardest math test ever. But today I got the best wasl snack ever. It was Ritz and an orange or some juice. Today I will go to Safeway for one of the cool Earth Day bags. I wonder which one I’m going to get. I think other people should shop at Safeway on Earth Day too. Only if they want to get a awesome bag though. I hope I can get an awesome bag before they run out. I hope I can even shop at Safeway on Earth Day. My mind is on lunch today. I hope we have some ravioli. My mind is also on after school. I wonder what I am going to do after school today. My lucky number is 10 because it’s the first 2 digit number. And I also like 4 because its one less than 5. I don’t know why I like 10 and 4. I guess I just do. My mind is on what my dad is doing. I wonder if he’s fixing pipes right now. My mind is also on what my mom is doing right now. I wonder if she’s sleeping. My mind is also on my brother. I wonder if he’s doing math right now. My mom is a great cook. She makes the best lumpia ever. She also cleans the house every now and then. She makes the house look shiny clean. She’s also really nice. She does a lot of things for my family and me. My mom works as hard as she can to make my family and me safe. She’s also really pretty. She’s awesome because she’s nice to every person in my family. The XO's are cool. There is Arbor Heights, Earth Day, Lincoln, Jude, and Mark Ahlness. I like EarthDay. I don't now why I like Earth Day best I just do. I also like Jude because I like his name. There are a whole bunch of XO's out there, you just have to go to the right places. My dad's awesome because he's really fun to hang out with. He's also really nice. He's also really cool. I like my dad because he's fun to play with when I'm bored. Puerto Morelos is in Mexico. Its a little city. It was a 45 minute walk to get there from the hotel I stayed at. I did the long walk with my family though. We walked the entire distance in the sand. After all that walking my family's legs were hurting so bad and that's including me. But I did get one cool thing. I got a nacho libre mask. Its so awesome. When I am in 4th grade I will miss Mr. A because I thought he was one of the coolest teacher. That’s why I will really miss him. I wonder how many articles I will make by the end of the year. I hope I make a lot. I think blogs are really fun because you can write lots of stuff on it. I think lots of people want a blog. 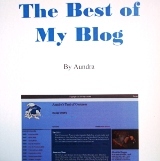 I wonder if I’m going to write articles on my blog when I’m in Middle School. I hope I do because writing articles is really fun. I wonder what my new password will be when I’m in 4th grade. I wonder if I would be able to remember it. I wonder how many articles I’m going to make in the Summer time. I hope I write a whole bunch in the Summer time.